I think ROYAL MAIL could have shown some pictures of William Shakespeare on the Stamps but all they can do is to print words( I for one will not be buying any. Since I have some interest in typography on stamps, I don't find the Shakespeare set ghastly, but I would say that Royal Mail missed the opportunity to do something much more inventive. Typography or not, ghastly is a term I would use for the 2011 Royal Shakespeare Company set. I see no problem with words rather than pictures on stamps. I will be buying some, but then I do have a couple of penpals who are English teachers or have studied English literature at university! And here's me thinking that RM finally issues a set of stamps I would like to buy (hasn't happened since the Dickens issue of 2012). I think the Shakespeare stamps are wonderful and I think that umpteenth royal issue is more deserving of the label 'ghastly'. Will the birthday self-adhesive retail book issued on 21st April have 4 x 1st class purple Machins or 4 x 1st class Diamond Jubilee Machin definitives as you have described on your website? Purple - as it reads lower down the page. I forgot to delete the earlier reference when reformatting the Diamond Jubilee page. Thanks for pointing this out. Sometimes the simplest designs are the best, though this set to celebrates Britain’s greatest writer does show a lack of imagination. The Robert Burns stamps from 1996 got the balance about right. But then you’re never going to please everybody all of the time. That reminds me of a Great song from the Band 'Nine Below Zero' "YOU CAN'T PLEASE ALL THE PEOPLE ALL THE TIME"
I tend to agree with Ian about the Shakespeare stamps. Would have liked to see some of Britain's great departed Shakespearean actors in character perhaps which could have added more thematic tangents to the set. I also have a lot of sympathy for Dave Morgan's point about the amount of top authors that have been overlooked completely compared to others with repeat appearances on GB stamps. Not *cough* Roald *cough* Dahl *cough* again *cough*. But RM still have to go some way to bore or irritate me more than the Xmas stamp issues. At least put Noddy Holder, Roy Wood and, of course, The Pogues with Kirsty MacColl on them sometime! Nobody in their right mind will see these and buy them. Another wasted opportunity. Would have been nice to see some pictures of where Shakespeare lived and was brought up. Mary Ardens' Farm, Anne Hathaway's Cottage, New Place - currently being revonated for 2016 opening, Halls' Croft and Trinity Church where he is buried. I guess they don't want to outlay too much money to produce stamps these days. Seems to be all drawings and black and white photos lately - keeping costs down. Even black and white photographs are printed in 4-colour litho on stamps. Humanitarians weren't - they were only printed in.... black. Thank you Robert, I didn't get blocks of that set, and there is no detail from RM. Yet again - no 2nd class value! Shakespeare set are dull and boring, with all of the greatest writers out this year, Terry Pratchet deserves a set of stamps, we still have Beatrix Potter and Agatha Christie to come, the latter sound more interesting to be honest, most of her books are pretty good, I'm expecting a 10 to 12 stamp set there to cover some great stories of her career. 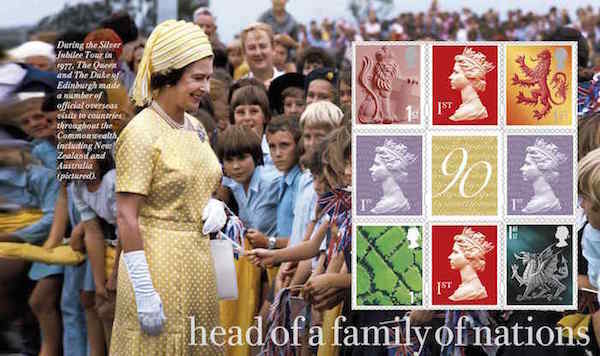 As for the Royal set, can we give the Royals to take a 5 year break to grace our British stamps, there is always a Royal set every blinking year, Royal Portraits, Buckingham Palace, Queen's Reign whatever next. A set of Prince Charles becoming King next, Big Ears gracing our stamps enough to put people off from buying them. I understand that Royal Mail will be commemorating West Ham United's move from the Boleyn Ground (Upton Park) to the Olympic Stadium with a stamp folder. And news on this yet, Ian? First I've heard of it. What's the source? Back page of the March 2016 Bulletin. Royal Mail stamp issue for 8th April: West Ham United Upton Park Tenure Stamps Sheet and Folder. Yet again RM are issuing stamps which are embargoed until the day of issue. Birthday Retail Booklet. Why you can not order them in advance from Edinburgh defies all logic especially for FDC collectors. Why do they do this. We don't all live next to a main Post Office. 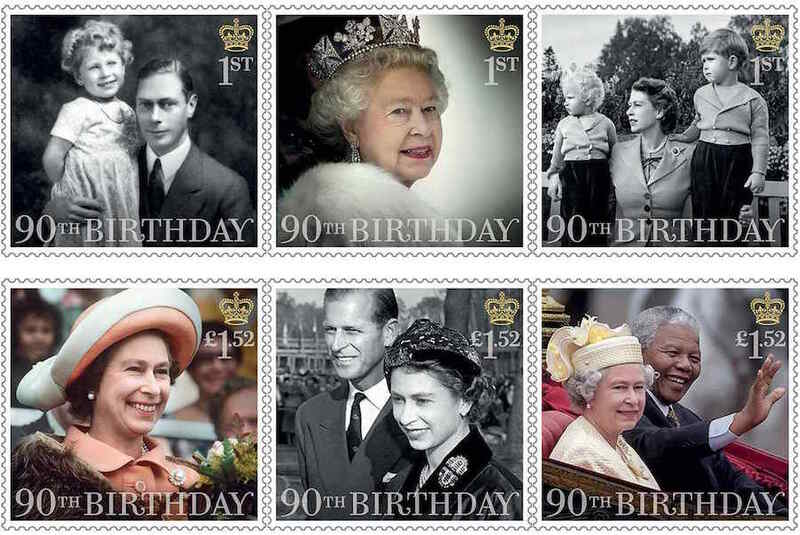 Queen's birthday stamps should be available to order for delivery on the day. Sadly it may take you that long to get through to Tallents House on the phone. Call me next Monday afternoon, I may be able to help. Shakespeare`s stamps are nothing spcial, but interesting for me, because 10 different fonts are used. Does anyone know what fonts exactly are used on stamps?